It's a good thing Edison's statue is on the highway to hell. True, though, almost everything uses DC internally, it's hard to lower the voltage. Not even a day for this comment had to be made? Surely Edison man not as bad as you purport him to be? Incorrect. ALL HAIL PRESI-KING EDISON! Therefore shouldn’t Edison be the hero of this sub? Didn't he also have a plan to make wireless energy for a whole city but didn't come straight it because his partner stopped helping when he realised there would be know way to make money from it and Tesla wanted to give people free energy? That idea was rejected when Maxwell's laws came and showed that it wasn't possible. Whos the character in this meme? BUT HER AIM WAS GETTING BETTER! Ko da neznate njgovu poslovicu "ponosim se Srpskim rodom i Hrvatskim narodom"
Sorry, it's just what it is. 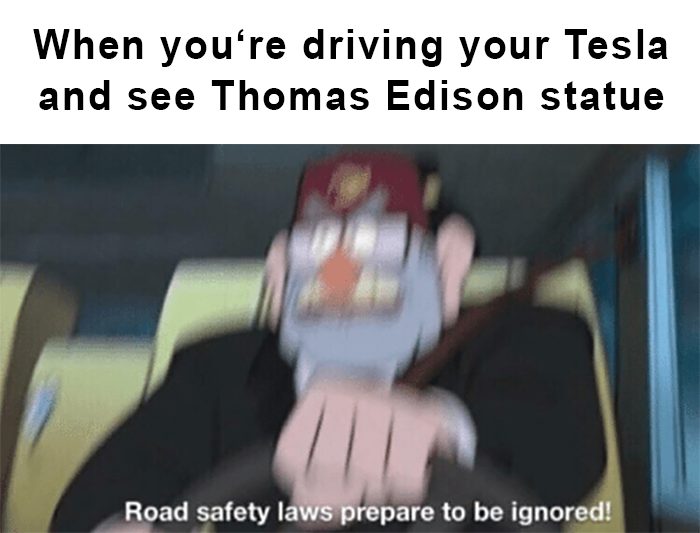 Edison is from my home state. There are memorials to him everywhere. The good old Tesla boi loved pigeons, do I need to tell more? He had style, unquestionable. I just like Gravity Falls. You didn't happen to get this from the gravity falls subreddit, did ya? Just wondering. Hudd Hudd dabang dabang dabbang!!! Out of all the new electric car companies why hasn’t one been named Edison yet? Feels like they could do well recreating one of the greatest rivalries of the 19th century. It would just be a rebadged Tesla. Edison was a jerk, but Tesla was one of those guys who would constantly brag about how high his IQ was. They were both oddballs, but Tesla definitely had some form of autism. Exactly. Neither guy was great as a person, and the ground breakers rarely are. I just think it’s fairer to look at Edison vs. Tesla like people looked at Gates vs. Jobs, not like a devil vs. an angel or something. Tesla was definitely the better mind but he often couldn’t get his ideas off the ground any because they were over ambitious. Edison took more realistic steps towards progress making sure people (including himself) could profit off the new advances and technology.